The Easter Bunny starting last years race! The race is a a regular feature of the local running calendar and is always held on Easter Saturday, which this year falls on 15 April 2017. The Rotary Club say it’s a very popular race for local runners and teams, with entries from across the region and beyond. The aim is to attract a field of some 400 runners across all running categories. Entries from teams are very welcome. Runners and teams often use the event as an opportunity to raise money in support of their own charitable interests. The race commences and finishes on the promenade adjacent to Boscombe Pier, taking in the length of the promenade towards Hengistbury Head and returning in a loop via Overcliff Drive. The Rotary club use this event as their own major fundraising initiative for the year and this year will be supporting the Cystic Fibrosis Trust, Bournemouth Hospital and the Narayan Devi School in Nepal, one of the schools totally destroyed in the earthquake in Nepal in 2015. 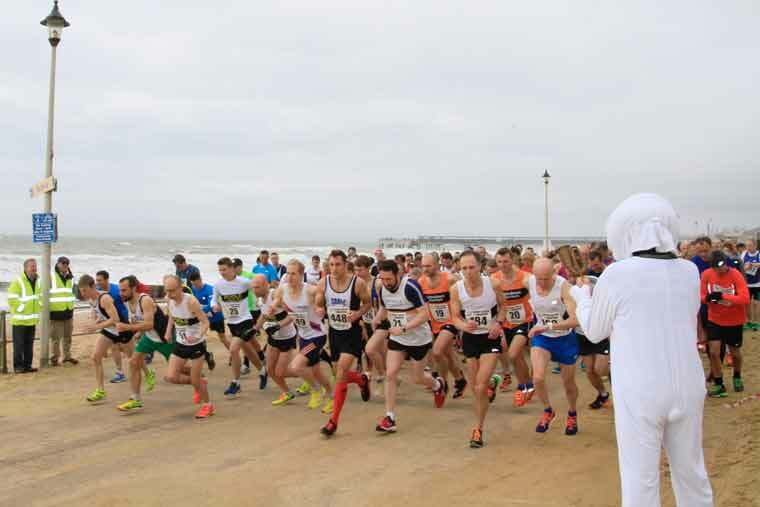 The Quarter Marathon is open to all runners, and further details and applications can be obtained via the Bournemouth East Cliff Rotary club website at: http://www.rotary-ribi.org/clubs/page.php?PgID=340533&ClubID=1564 or through Runnersworld, EventBrite or Run Britain. More details can be obtained from Keith Loveless – Race Director on 07768 197095 or Peter Jones – Course Marshal on 07746 826872.